Karen Beeman, M.Ed., Cheryl Urow, M.Ed. Cheryl Urow began her career as an educator in rural Costa Rica and later in the United States as an inner-city dual-language teacher. Since then she has had the opportunity to provide professional development across the country for schools, districts, and other organizations supporting the education of English language learners. More recently, Urow has focused her professional work on areas related to biliteracy development—the strategic use of languages in bilingual, two-way immersion, one-way immersion and dual language classrooms; authentic strategies for Spanish literacy instruction; and the Bridge between languages. Urow is a sequential bilingual who learned Spanish while serving as a Peace Corps volunteer in Costa Rica. 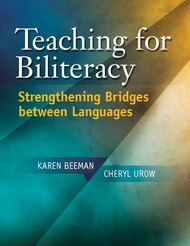 She is co-author, with Karen Beeman, of Teaching for Biliteracy: Strengthening Bridges between Languages and co-founder of the Center for Teaching for Biliteracy, an online forum for supporting and connecting educators who teach for biliteracy.